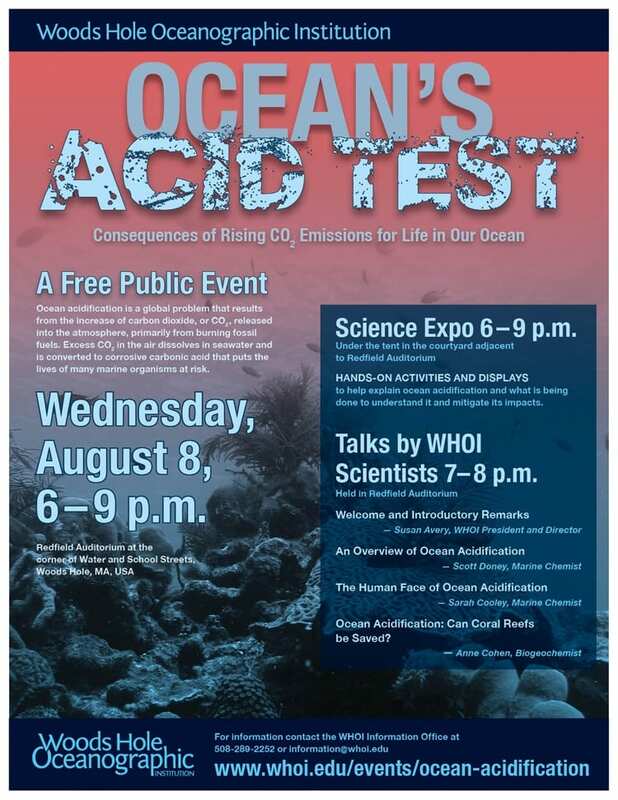 “Ocean’s Acid Test: Consequences of Rising CO2 Emissions for Life in Our Ocean” will be held on Aug. 8 at 6 p.m. in Redfield Auditorium. A science expo from 6-9 p.m. outside the auditorium will feature hands-on activities and displays to help explain ocean acidification and what is being done to understand it and mitigate its impacts. 45 Water Street, Woods Hole, Mass. Since the beginning of the Industrial Revolution, when humans began burning coal in large quantities, the worlds ocean water has gradually become more acidic. Like global warming, this phenomenon, which is known as ocean acidification, is a direct consequence of increasing levels of carbon dioxide (CO2) in Earths atmosphere.